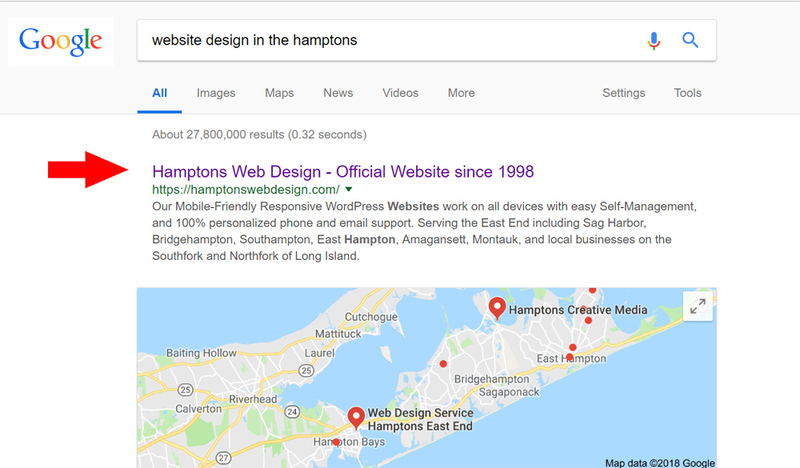 Click the Button Below then look in the Search Bar it will say "Website Design in the Hamptons"
Below the Ads, which dominate the top of any search results, are Google My Business Listings and then Free Listings. Hamptons Web Design's SEO is so good Google puts us BEFORE The Google My Business Listings and right under the Ads. In the Google My Business Space, where Google selects 3 Websites from an abundance of them, Hamptons Web Design is FIRST. What IS - SEO Exactly? Search engine optimization (SEO) is the complex and ongoing pursuit of improving visibility of your website in the various search engines, such as Google, Yahoo, Bing and others. This helps in both the unpaid search results and also in paid Google Advertising and today, in Local Search such as Google My Business Pages, and Social Media. By optimizing you may show up higher in a search for your business or industry. The higher you are ranked on the search results page, and the more listings that show up about your business, the more visitors it will receive from the search engine's users. Over 90% of searchers never move past the first page of results. There are no guarantees on how the search engines will place your website. 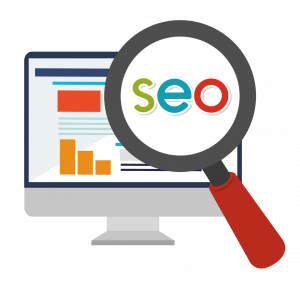 But through "Keywords" or "Key Phrase" Optimization, content optimization relating to these keywords, and other SEO requirements, there is a better chance of your website appearing on the first page of the free local business search results, higher placement for your Google My Business Page, and, Paid Advertising. SEO means Google and other engines view your site as important for specific searches related to what you offer. Insure all Code and Tags are in place for headers, titles, photos, alt tags, etc. TIP - Utilizing Google's Ad Metrics, Google Analytics, and other Analytic Statistics, tells us the specific search terms people are using to actually go to your website, Rankings, your competition, and much more. The invisible world of online activity, can be brought to full light today with our programs. We then can consult with you to add content to your website's pages, which deepens the value of that important search term for your business. NOTE - SEO is a Team effort. HWD provides information, guidance, and design, but there are tasks you or someone in your office will need to do. We help create a workable strategy for you so this becomes part of your overall business task process. The site, is important and if you want to go to the next level, Hamptons Web Design can help. Be Found in Important Local Directories.